I have a list of the wonders of the world. You know, every travel group seems to have one now. But, I found one that I had done many things on and what I wanted to do more of. Angel Falls was on that list. 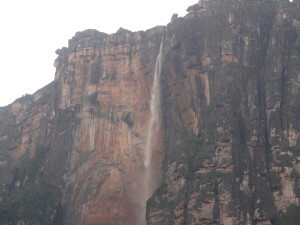 Now if you aren’t familiar with Angel Falls, watch the cartoon movie “Up”. The goal is for the husband to get the house up next to the falls.. Angel Falls. It is also the tallest free drop waterfall in the word. So in November 2012, the hubs and I pack our bags and first head to Caracas. I love to research a lot of stuff before we go, but for some reason there is not a lot of good information on Angel Falls. (well, maybe there is in Spanish, but I am not that fluent yet). As we normally do, we just decided to wing it. First we stop off and see my wonderful in-laws and nieces/nephews. We tell them we want to go to the falls. (OH, BTW, it was also my birthday). My sister-in-law calls someone she knows and we go to the travel agency. They really were not helpful and were trying to get us to take a plane ride over to see the falls. No, I wanted to experience riding the canoe up and really seeing the falls. Not from up high. Now, a few years before that, when we visited Margarita Island, we got most of our travel done by an agent at the American Express shop in Sambil. I know, it sounds crazy but they are reliable and get us what we wanted. So, off to Sambil we went. 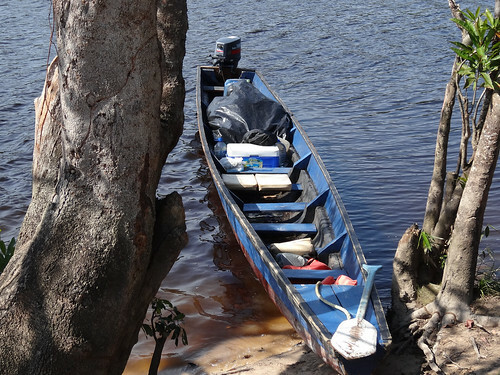 When you get to Canaima, your tour group picks you up from there and takes you to their camp via a truck/open bus. Our big mistake was we waited until the last minute. I would highly recommend you not wing it. 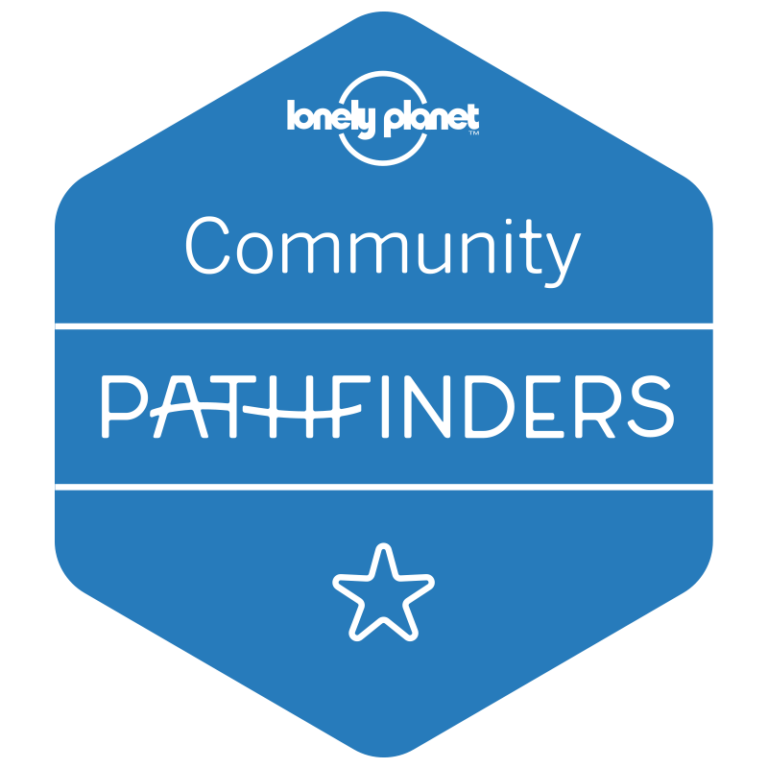 Find a tour group you like and book the trip through them. The entire park is reserved and you cannot access anything without a tour. When we left Caracas we only had a ticket to Puerto Ordaz. The ticket counter in Caracas had spoken to the person in Puerto Ordaz and they would have our ticket. So, we got on the plane and flew to Puerto Ordaz. At the airport, we went to hotels.com to book a room. The Howard Johnson was the only chain I was familiar with and we were tired and didn’t want to risk it. We take a cab from the grocery store across from the airport to the hotel and they do not have our reservation. That’s okay, they had an open room but we needed to pay in exact money. Sigh.. 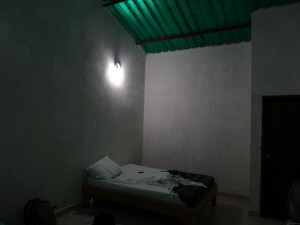 The room was nice, and I would stay there again. So we wake up, have a great breakfast, and take a cab over to the mall to get our tickets. When we got to the mall and found the woman, there was a very long line of people. Then we had to wait for the woman to return from lunch. Then the woman was waiting from a fax from another office. However that office lost electricity and could not fax the form. And by the way, she was going home at 4pm so if the fax wasn’t there we would have to wait the next day. OMG! Eventually after much worrying, the fax came, the tickets were there and we were able to get on the plane. Jungle here we come! The flight to Caniama was kind of cool, in a very unsafe sort of way. There was no “turn off your electrical devices and buckle up”. There were about 12 of us on the plane and when we all got in we just left. We arrived into a field, that had a very large hut like building. There was a man walking around in tribal wear, but I think that was more for show. Eventually our truck arrive and we got to camp. 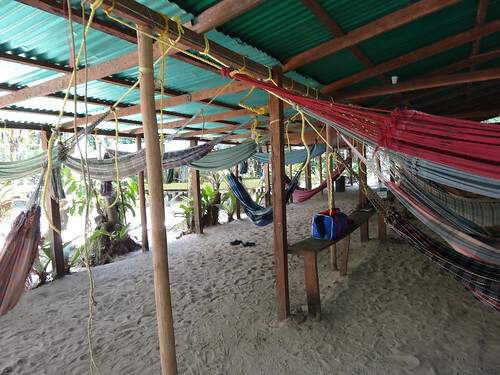 This was the first night’s bed in Canaima. This was before we took the canoe up to the falls. 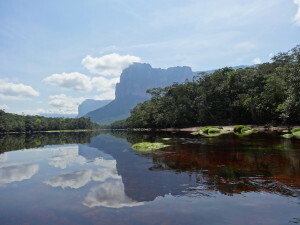 This is outside our room at the camp in Canaima. 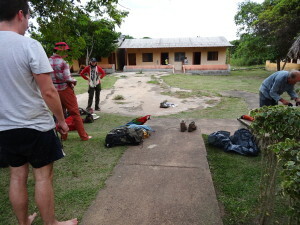 Note the parrot who wrecked havoc on everyone’s stuff. 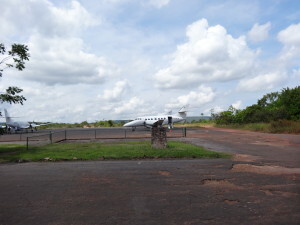 This is the Aeropuerto Canaima. 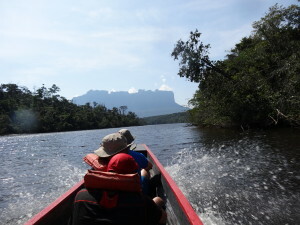 Our tour consisted of the first day at El Sapo and the next Two (there and back) at Angel Falls. First, let me say that all I researched was Angel Falls. I did not realize how amazing El Sapo is. If you have time to visit it, go. Climb behind the falls and really experience it. This YouTube video is probably the best illustration of what it is like, the walking the climbing etc. YouTube Link to El Sapo When we left, our guide didn’t tell me where we were going and said we were going site seeing. So, I wore sandals. Worse decision ever. It was so hot and I thought we were going for a leisurely stroll. So, always be prepared and I learned my lesson. Also, do not underestimate how hot in will be. Carry your water with you at all times. This is the jungle; they do not have people selling water as you walk in the open fields. Also, wear more sun screen than you ever thought would be enough and then put a little more on yourself. The sun is closer to you as you are close to the equator and before you know it you are fried. And again, this is the jungle so there are not any places that sell aloe or sun burn help. So, the next morning we get up and start the journey. I cannot over state how important ziplock baggies are. Every trip they have saved my stuff. To get to the falls, you can only take your bag and they pile them all up in the back of the canoe. Then all you can do is pray water doesn’t get in them. Put everything in baggies and you will be okay. The view we saw from the canoe ride was worth every single frustration to get there. There are many pictures in my smug mug account (My Vacation Photos). Unless you are short on time, do not forgo the canoe trip for the airplane ride. You will miss the best part of the trip. Spending 5-8 hours in a peaceful canoe with the natural beauty is just amazing. Seriously. Do it. So, we arrived at camp and had a delicious meal of poultry cooked over the campfire. We slept in hammocks and the sound of nature was really cool. I have camped, but never in the middle of untouched land. It truly was fantastic. You spend the night there under the falls. Depending on which package you get, some people walked to the base of the falls, which was another trek upward. I did sneak around and look at the other camps. We were there off season (Nov 22) so many of them were not functioning. You can choose from many options so I’d spend some time looking if you are able. However, at the end of the day, everyone sleeps around the same area outside. I wouldn’t spend too much money on accommodations. You cannot experience anything like this anywhere else. Going home was an adventure all in its own. Read about how we got lost, ended up in another town and saw an Andy Warhol here at “Being Left in the Jungle“. 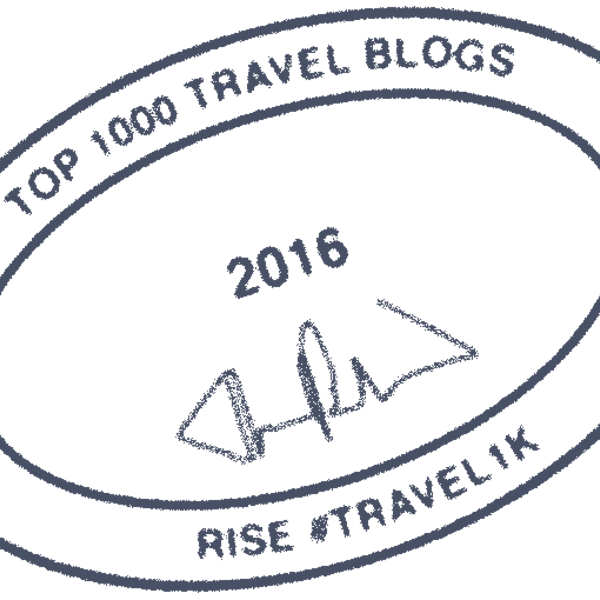 Feel free to reach out to me if you want advice or questions about your upcoming trip. Take lots of sunscreen and use it! Wear good hiking water shoes. Remember to enjoy the experience and go with the flow. Some of the people I met on the trip we still talk with today. Enjoy yourself and you might find little hidden gems of the world you didn’t know existed. Did you mention the language barrier? I know its SA but did the natives speak English?